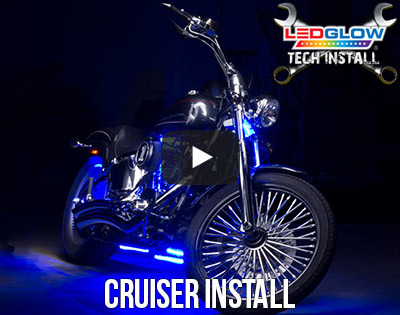 LEDGlow’s Advanced White SMD LED Motorcycle Light Kit includes ultra-bright SMD LEDs, waterproof control box, (2) wireless remotes, and all necessary mounting hardware to create a solid white glow to your motorcycle. LEDGlow’s Advanced White SMD LED Motorcycle Lights is the next generation of motorcycle lighting as it adds a complete and spotless glow to any motorcycle by utilizing SMD technology that standard 5mm LEDs cannot compete with. What are the major differences between the SMD motorcycle kit and the standard LED motorcycle kit? To simply put it, the SMD lighting kits are much brighter by featuring more LEDs and the light strips are much thinner than the standard LED motorcycle kit. The White SMD Motorcycle Kit features an expanded LED count with its SMD chips, resulting in more LEDs working together to produce a vibrant aura surrounding your bike. A single SMD chip contains 3 concentrated LEDs, which produce a much brighter, wide angle illumination with less spotting than standard 5mm LEDs. Another major difference between the SMD lighting kits and the standard LED light kits is that the light strips for the SMD kit are much thinner with an 1/8" in depth and are able to be mounted in tighter areas, completely hiding the strip and exposing a more complete, vivid glow. These white motorcycle LED lights are offered in 6pc – 18pc kit options packed with an assortment of innovative abilities and safety features. The included waterproof control box features a solid color mode with 4 brightness levels, 3 flashing modes and 1 fading mode that are all easily selected using one of the two wireless remotes. The waterproof control box features a new, unique round design that measures at 1 5/8” in diameter and 5/8” in height making it extremely easy to hide under the seat. Attached to the control box is 18" of wire with a male modular connector that connects to the power harness and 12" of power and ground wires that connect to the battery. The power wire features a waterproof 2 amp inline blade fuse that protects the power circuit of the control box. Each 1/8” in depth, waterproof light strip comes included with 4’ of power wire for maximum mounting capabilities and is able to be cut every two SMD chips for easier mounting on smaller and tighter locations. LEDGlow includes installation instructions, a one year limited warranty and free lifetime technical support with each purchase. LEDGlow's Wire Extensions easily connect to the power wires on your flexible LED lighting strips to extend the 4' power wires to additional 1', 2', 3' or 5' lengths. This is perfect for larger bikes or lighting strips that are being mounted in locations further away from your control box. 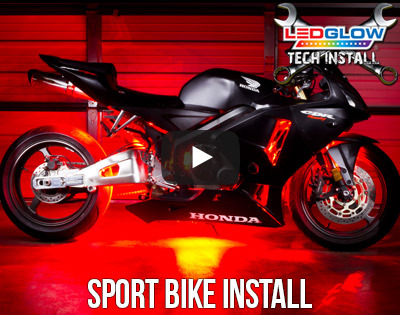 LEDGlow is now offering 3M™ Adhesion Promoter, which is a liquid primer that creates an extra layer of adhesion between the LED strip and the mounting surface your bike when installing one of LEDGlow’s Motorcycle Lighting Kits. Using this adhesion promoter is not required for installation, but allows for a much stronger bond than simply installing the light strip with the included 3M™ Tape on the lighting strip. Just the right amount of light needed to be noticed on the road and not attract the wrong kind of attention. I was a bit worried about placing near my exhaust (about 1/2 away) but haven't had and issues at full operating temperature.